Dr. McCormick grew up in Kingsville, only briefly leaving the area to pursue higher education. He attended the University of Waterloo for Honours Bachelor of Science prior to attending their school for Optometry and Vision Science. 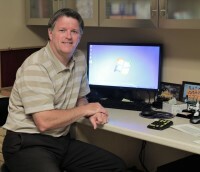 Upon his graduation in 1996, Dr. McCormick moved back to Kingsville and began working as an Associate with Dr. Molzan. You can find Dr. McCormick seeing patients all over Windsor-Essex County in Kingsville, Leamington, and Windsor. In his spare time, Dr. McCormick enjoys spending time with his wife and two children exploring the outdoors. Dr. Molzan attended the University of Waterloo for one year in the General Sciences before being admitted to the University of Waterloo School of Optometry and Vision Sciences. In 1977, Dr. Molzan graduated and promptly returned to Kingsville to begin his career. Currently, he sees patients in both Kingsville and Leamington but when he's not in the office, Dr. Molzan is kept busy with his three children and two grandchildren. When he gets the chance you can also find Dr. Molzan exploring and touring any of the great wineries that Windsor-Essex County has to offer. Dr. Mockler knew at a young age she wanted to become an Optometrist after getting her first pair of glasses at Kingsville Eye Care. Graduating as Valedictorian from Kingsville District High School in 2009, Dr. Mockler attended the University of Windsor for Behaviour, Cognition, and Neuroscience. Looking for new experiences, Dr. Mockler attended the New England College of Optometry in Boston, MA. She developed her love for patient care with special interests in specialty contact lenses and low vision care. Graduating in May 2018, Dr. Mockler returned to her home town hoping to make a difference in Kingsville. At Kingsville Eye Care, our doctors know they need the best support to provide your care. That's why we have Bev, Lori and Katherine working in the front end of the office. They will be able to assist you from the moment you book your appointment with everything from insurance questions to selecting the most stylish frame to flatter your face.